Are vegetable oils bad for your health? Does the quality of fats in your diet really matter? Absolutely! Welcome to the first of our new Quick Hits feature episodes, delivering the quick and dirty details on topics that are important to you and your health. In 15 minutes or less we’ll deliver important health info to you to keep your mind active whether you’re waiting in the carpool lane, on your morning commute, or fitting in a quick workout! Why are industrial seed and vegetable oils bad for your health? In this Quick Hits episode, Dave Korsunsky sits down with Dr. John Limansky, MD board-certified physician of Internal Medicine to ‘chew the fat’ on this important topic. We’re diving in quick to get you the big ideas and then we’ll provide you some resources at the bottom of the page for further reading if you want to learn more. 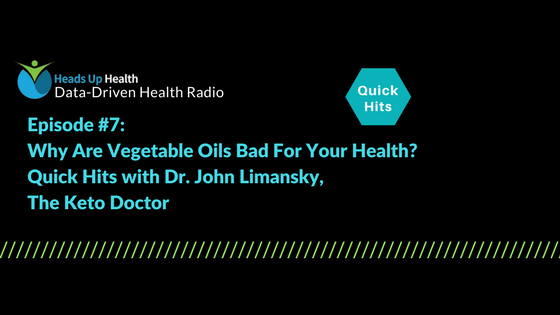 You’ll get a quick intro into why vegetable oils are bad and why you should take measures to avoid them in your diet for optimal health. While ketogenic dieting has gained a lot of popularity, it is important to note that the quality of fats is just as, if not more important, than the quantity you consume. You literally build your body with every bite you take, so take a few minutes to learn just why are vegetable oils bad and why you should avoid them. Are you still unclear on which fats are good, and which are associated with increased health risks? Take a listen and see how your diet rates! This podcast is brought to you by Heads Up Health, a web app designed to help you centrally track all of your vital health data. Instantly synchronize your medical records, connect your favorite health devices and apps like MyFitnessPal or MyMacros+ and use your data to optimize your health! Why are seed and vegetable oils bad for your health? Learn more about LEVL, a clinical-grade breath ketone analyzer, which measures your level of fat-burning and ketosis through a simple breath. Find out more at HeadsUpHealth.com/LEVL.